Robust cell adhesion is known to be necessary to promote cell colonization of biomaterials and differentiation of progenitors. In this paper, we propose the functionalization of Silicon Oxycarbide (SiOxCy) nanowires (NWs) with 3-mercaptopropyltrimethoxysilane (MPTMS), a molecule containing a terminal –SH group. 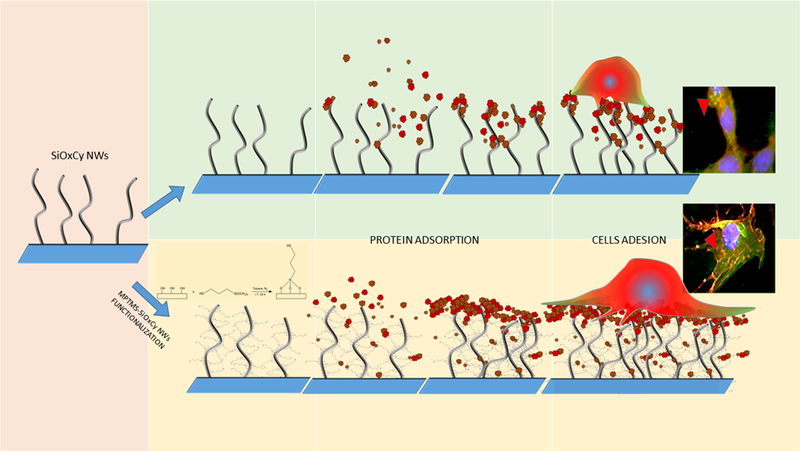 The aim of this functionalization was to develop a surface capable to adsorb proteins and promote cell adhesion, proliferation and a better deposition of extracellular matrix. This functionalization can be used to anchor other structures such as nanoparticles, proteins or aptamers. It was observed that surface functionalization markedly affected the pattern of protein adsorption, as well as the in vitro proliferation of murine osteoblastic cells MC3T3-E1, which was increased on functionalized nanowires (MPTMS-NWs) compared to bare NWs (control) (p < 0.0001) after 48 h. The cells showed a better adhesion on MPTMS-NWs than on bare NWs, as confirmed by immunofluorescence studies on the cytoskeleton, which showed a more homogeneous vinculin distribution. Gene expression analysis showed higher expression levels for alkaline phosphatase and collagen I, putative markers of the osteoblast initial differentiation stage. These results suggest that functionalization of SiOxCy nanowires with MPTMS enhances cell growth and the expression of an osteoblastic phenotype, providing a promising strategy to improve the biocompatibility of SiOxCy nanowires for biomedical applications. The authors would like to thank Dr. Galli Gianfranco (Dip. Scienze Matematiche, Fisiche e Informatiche, University of Parma, Parco Area delle Scienze 7/A, 43123 Parma, Italy) for his technical help in Z-potential measurements. The paper was written through contributions of all authors. 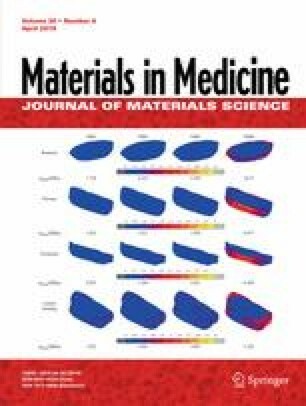 All authors have given approval to the final version of the paper.